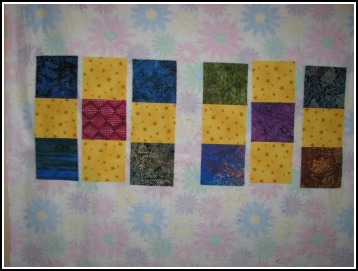 I have these really colorful batik charm squares and I wanted to put them together with some type of bright cotton. 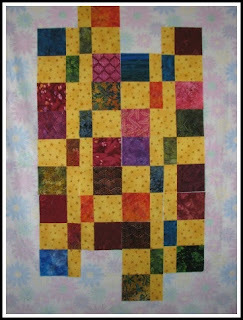 I had a few people pick the cotton from three bolts I had here at Quilt Lodge in Red Lodge Montana. The overwhelming favorite was a bright yellow with golden stars from the Dusty Trails collection. 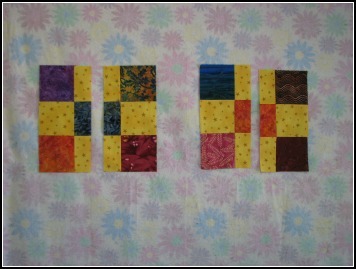 I didn't really know what was going to happen, I just started sewing blocks together. The first issue? What size to cut the yellow blocks? The charm packs are listed as 5 inch squares, but if you use the pinking edge as a guide, they're really 5.25 inch squares. 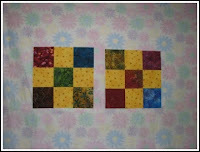 I decided it was easier to just cut my yellow blocks 5.25 (I'm not good at measuring, so the easier the better). I started my nine patch blocks with a batik on each end and a yellow stars in the middle. 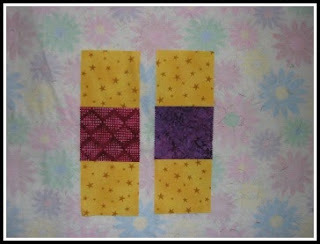 I did goof up a few squares when I sewed them together making a totally different 9 patch. 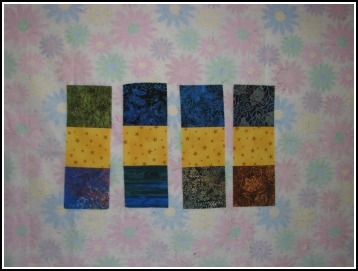 So in order to make this whole thing more interesting I made 12 blocks with 5 batik squares in each and 4 blocks with 4 batik squares. Thank goodness for a design wall to play around with. Here's a few ideas of how to slice these blocks up, play around with them, and then sew them together. Now comes the fun part, just start slicing these blocks in half. Since I worry about measuring, I used my iron to make a fold mark in the middle of each block, then I sliced at that point, which ends up being the middle of the block. Next I played around on the design board (very expensive vinyl tablecloth pinned to my wall backwards, the flannel back is perfect! You can see that the pattern could look very complicated, but really, it's so simple! Stay tuned for part 2 of the 9 Patch Slice and Dice.